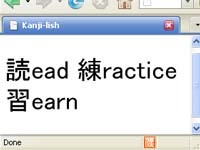 There’s a Firefox add-on called Characterizer (originally Kanjilish, for Japanese) which replaces parts of words with Chinese characters. My initial reaction was that it was just gimmick without much real value, but I’m starting to wonder. > As a busy professional, I don’t always have time to practice Japanese as much as I like. I developed this add-on so that I could keep kanji characters fresh in my mind, even when I wasn’t reading Japanese. So the idea is to semi-passively reinforce characters already learned. Makes sense. One part that intrigues me about the add-on, though, is the missing letter. Every time your brain encounters a word with its first letter replaced by a Chinese character, for just that split second, it kind of freaks out, but then recovers gracefully. I feel that my brain, however, is definitely focused on decoding the proper English word, treating the mildly horrific character-letter hybrid as a sort of captchaesque nuisance blocking its way to comprehension. The characters are just mentally swept away by this process. > Aoccdrnig to rscheearch at Cmabrigde uinervtisy, it deosn’t mttaer waht oredr the ltteers in a wrod are, the olny iprmoetnt tihng is taht the frist and lsat ltteres are at the rghit pclae. The rset can be a tatol mses and you can sitll raed it wouthit a porbelm. Tihs is bcuseae we do not raed ervey lteter by it slef but the wrod as a wlohe. What I really wonder, though, is: what effect would prolonged exposure to character-letter hybrids have on someone who has never studied the characters? Would they eventually start to form associations between words and characters? The longer ones definitely seem to work better. If you don’t read Chinese, how many of the place names above can you read? How did you fare in the two lists above? Was version 1 a lot harder? How about 2- versus 3-character names? The names are roughly in “fame order.” Did it get harder as you went along? You could take the concept in a lot of directions. Definitely worth exploring some more.